Octagon Notes: After Charlemagne, what? 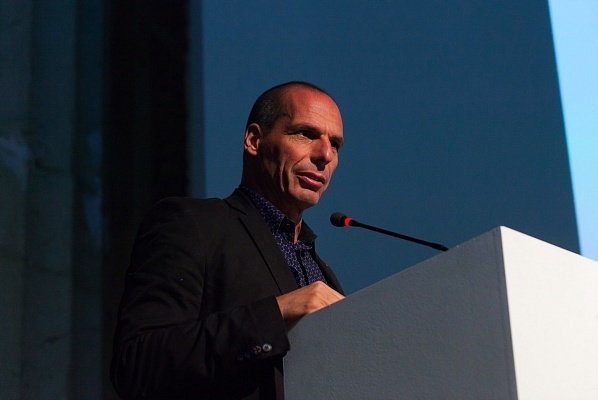 Yanis Varoufakis is an acute economic and political commentator and I follow his work with interest. In a keynote presentation at a Moscow cultural conference, the Moscow Biennale for Contemporary Art 2015, he brilliantly combined economics, art, politics and our contemporary global neoliberal dilemma with wit and insight. Varoufakis clearly has a good working knowledge of European film and makes some telling points through that media. My favourite instance is where he refers to The Third Man. Another instance of his imaginative and creative synthesis is how he sees the figure of Charlemagne used as an ambivalent feature in the European imagination. "Let me take you to an interesting moment, in 1978: It was autumn, it was September. Two suited men entered Aachen’s cathedral where the remains lay of Charlemagne, the great Christian king who unified Europe into the Holy Roman Empire. The two suited men were President Giscard d’Estaing of France and Chancellor Helmut Schmidt of Germany. The reason they went, according to what they told us later, is that they had just signed a treaty. It was called The European Monetary System Treaty. It was the beginning of Europe’s common currency, when they decided to create a monetary union between France and Germany that, in the end, brought as the euro. So why did they go to the cathedral, to the tomb of Charlemagne? Their own explanation is that they felt trepidation, anxiety and they needed Charlemagne’s blessing. This is a cultural reference. It is a bit of Eurokitsch and reminds one of the Eurovision’s aesthetic. But let me also draw another two historical parallels. In 1993, when the European Central Bank was created, the President of that bank (called The European Monetary Institute at that time), felt that he was doing his duty according to… Charlemagne! Let me give you now a third dimension, which is pretty nasty. It is 1944 December, The last fresh unit of the SS is formed in Berlin. It comprises 11.000 Frenchmen who were collaborators of the Nazi regime. They were the ones who fought tooth and nail to defend Hitler to the last moment. Of those 11.000 only 13 survived as they fought to the bitter end. What was the regiment called? Charlemagne." Not everyone would have made those connections! I recommend you read the article at https://varoufakis.files.wordpress.com/2016/07/varoufakis-moscow-keynote.pdf.